One of the most fascinating figures to ever live was born 246 years ago. For Napoleon Bonaparte’s birthday, here are 15 things you might not know about the general-turned-emperor-turned-icon. 1. HE HAD A FORMAL MILITARY TRAINING. Napoleon was born into a family of minor nobility on Corsica­—a large island off the coast of Italy—a year after it became a French territory. His parents were well off enough to send him to school in France, although he never lost his Corsican accent and claimed to have been teased for it throughout his life. As a teen, he attended the prestigious École Militaire in Paris, but when his father died in his first year there, the younger Bonaparte (whose name was actually “Napoleone di Buonaparte” before he changed it as a young adult to sound more French) was forced to graduate early to help his family financially. Cutting his studies short caused Napoleon’s grades to suffer and he ended up graduating 42nd in a class of 58 students. He did, however, earn the distinction of being the first Corsican to graduate from École Militaire. At 16 years old, Napoleon became an officer in the French army. 2. HE WAS ORIGINALLY A CORSICAN NATIONALIST. Although Napoleon was single-handedly responsible for and synonymous with the first French Empire, as a young man, he longed to see his homeland overthrow French rule. His parents had opposed French rule since before he was born, and during his youth Napoleon wrote a series of treatises on the history and government of Corsica in which he calls the French “monsters” “who are said to be the enemies of free men.” (His plans for a full book on the island country never came to fruition.) In the late 1780s and early 1790s, Napoleon returned to Corsica for long stretches, avoiding the early stages of the French Revolution. But during these visits home, he was struck by how provincial the island was and how much bigger the world at large seemed in comparison. His mannerisms and preoccupations were becoming more French. Meanwhile, Corsican governor and former idol to young Napoleon Pasquale Paoli became increasingly Anglicized. Ultimately, it was a clash between the Buonaparte family and Paoli that inspired Napoleon to leave Corsica once and for all. 3. HIS FIRST WIFE, JOSÉPHINE DE BEAUHARNAIS, BARELY ESCAPED EXECUTION. Born into a plantation family in Martinique, Joséphine married into French aristocracy when she wed Alexandre de Beauharnais at the age of 16. Although her husband wanted nothing to do with her, she seduced and charmed other high society men, but that didn’t save her from imprisonment in Les Carmes as the Revolution swept through Paris. Her estranged husband was sent to the guillotine, but the day before her trial, the government was deposed and the executions halted. Having just barely escaped with her life, Joséphine quickly became a popular socialite, eventually meeting Napoleon at a party in 1795. She was 32, widowed, and established in French society; he was just 26, shy and inexperienced. At their wedding six months later, she reportedly knocked four years off her age on the marriage certificate and he added 18 months to his, which made them roughly the same age (at least on paper). Of course, we can’t know everything the couple said to one another in private, but judging from letters between the two, Napoleon was desperately infatuated with his wife and expressed an insecure neediness that, if anything, put her off intimacy. The young general embarked on his Italian campaign just a few days into the couple’s marriage, writing to her almost constantly from the battlefield. For her part, Joséphine seems to have struck up affairs back in France in her husband’s absence and her silence drove him to send increasingly pleading missives. 5. HE WASN’T ACTUALLY SHORT. 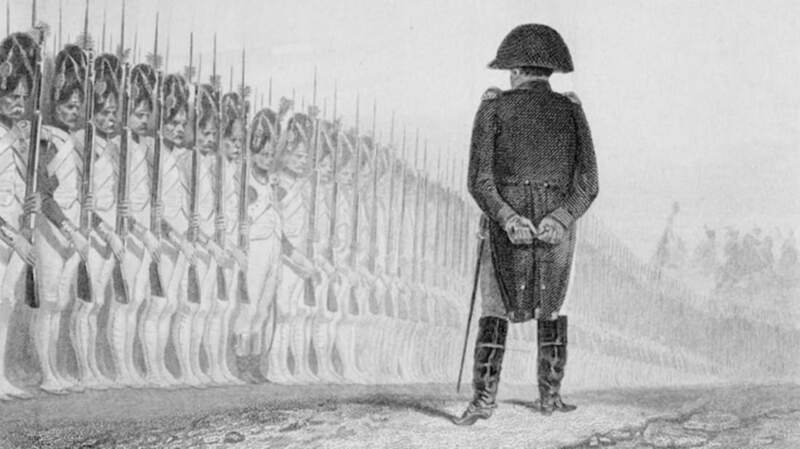 The rumor about Napoleon’s height—or lack thereof—started during his lifetime. English propagandists depicted the general as comically diminutive in critical cartoons during the Napoleonic Wars. The belief became so deeply established that in the 20th century, a psychological complex specific to short men was named after him. But how tall was he really? Probably around five-foot-six—which was actually just about average for the era. That height comes from what was written at the time of his death. A physician’s note that accompanied Napoleon’s coffin says that he was five-foot-two “from the top of the head to the heels”—but an additional note specifies that this is French measurements and that it is equal to five-foot-six in English terms. 6. HE ONCE WROTE A ROMANCE NOVEL. That’s right, Napoleon Bonaparte was a general, a revolutionary, an emperor and—on at least once occasion—a romance novelist. Written just before he met and married Joséphine in 1795, Clisson et Eugénie tells a fictionalized account of the young soldier’s relationship with Bernardine Eugénie Désirée Clary, whose sister married his brother Joseph. The novella was never published during his lifetime and following his death, the manuscript was divided into segments that sold as souvenirs at auction houses in the centuries after. Although the various segments were published at one time or another, a complete English translation wasn’t reconstructed until 2009. If you’re interested in reading the tale of passionate lovers separated by war and ultimately death, you can find Clisson et Eugénie on Amazon. 7. HE PROBABLY WASN'T AFRAID OF CATS. There are a lot of claims swirling about that Napoleon—and many other famous generals-turned-dictators—suffered from “ailurophobia,” or fear of cats. But Katharine MacDonogh, author of Reigning Cats And Dogs: A History Of Pets At Court Since The Renaissance, says that “No record exists of Napoleon either liking or hating cats." 8. NAPOLEON’S ARMY DISCOVERED THE ROSETTA STONE. Napoleon is best remembered for his political and military prowess, but during his early life, he also considered himself a scientist, and was elected membership to to the National Institute, the foremost scientific society in post-Revolutionary France, in 1797. For his expedition to seize Egypt and thus cut off Britain’s trade route, Napoleon brought along 150 savants—scientists, engineers, and scholars to survey the topography, environment, culture, and history of Egypt—in addition to his troops. The 23-volume Description de l'Égypte contained unprecedented knowledge of the country, but perhaps the greatest find was the Rosetta Stone. Captain Pierre François-Xavier Bouchard discovered the inscribed slab during the demolition of an ancient wall in the city of Rosetta. He immediately recognized the potential significance and had the stone shipped to Cairo. Written in hieroglyphic, demotic, and Greek, the Stone eventually proved to be the cipher that cracked ancient Egyptian hieroglyphs. 9. BEETHOVEN ORIGINALLY PLANNED TO DEDICATE HIS THIRD SYMPHONY TO NAPOLEON. He seems to have remained conflicted about his former idol, however. In a later letter, he admitted that "the title of the symphony really is 'Bonaparte’,” and when it was published in 1806 the title page read, "Sinfonia Eroica ... composed to celebrate the memory of a great man." 10. NAPOLEON’S EMPIRE ATTEMPTED TO SPREAD RELIGIOUS TOLERANCE. As a child, Napoleon was baptized Catholic, but his own writings indicate that he began to question Catholicism—and, indeed, the existence of any god—early in his life. But while Napoleon lacked a strong personal faith, he admired the tactical power of organized religion. Following his initial ascent to power in France, he set about reestablishing the Catholic Church that had been all but dismantled during the Revolution. In doing so, however, he recognized Catholicism only as, “the religion of the vast majority of French citizens” and brought the Church under the authority of the state. As emperor, Napoleon emancipated the Jews in areas of Europe under his control, insisting that they be free to own property and worship freely (a proclamation which earned him condemnation as the "Antichrist and the Enemy of God" by the Russian Orthodox Church). Of course he did so not out of pure benevolence but because he believed religious freedom would attract Jewish populations to the French-controlled territories. Following his Egyptian expedition, some scholars believe that Napoleon was particularly fascinated by Muhammad and the Muslim religion. Although this, too, appears to be largely situational, as he once wrote, "I am nothing. In Egypt I was a Mussulman; here I shall be a Catholic." Whether or not Napoleon ever truly believed in Islam, he wrote tolerantly about even some of the more controversial practices, saying that polygamy was a way for different races to remain blended and equal. 11. NAPOLEON ATTEMPTED SUICIDE BEFORE EXILE IN ELBA. Following a disastrous campaign in Russia and pressures from the Sixth Coalition, Napoleon was forced to abdicate as part of the Treaty of Fontainebleau on April 11, 1814. Although he would at first be sentenced to live out a comfortable life as sovereign of the island of Elba, Napoleon’s first reaction to his exile was a suicide attempt while still at Fontainebleau. He had been carrying a poisonous pill with him ever since the failure in Russia and finally took it on April 12th. But the pill must have lost its potency with age; while it made Napoleon violently ill, it did not kill him. 12. BRITISH SOVEREIGNS WORRIED THAT EVEN THE ENGLISH PEOPLE WOULD RALLY AROUND NAPOLEON. Following his escape from Elba and his brief return to power, Napoleon was defeated at Waterloo and forced to surrender to the British captain of the HMS Bellerophon. Initially, he drafted a letter to the Prince Regent and future King George IV requesting asylum and "a small estate" outside of London—a bold request considering his years of plotting to conquer Britain. The letter was never delivered, but it likely wouldn’t have mattered. Parliament was concerned that Napoleon—a foreign dictator—would be so popular with the British common people that they refused to even let him disembark. Instead, he remained on board the anchored Bellerophon while crowds flocked to catch a glimpse of him until he was banished to St. Helena. 13. ATTEMPTS TO RESCUE NAPOLEON FROM ST. HELENA INCLUDED AN ELABORATE SUBMARINE PLAN. The British took extreme caution in securing Napoleon’s final exile location. St. Helena is isolated, ringed with steep cliff faces, and was guarded by some 2800 men armed with 500 cannons. The seas around the tiny island were constantly patrolled by an entire Royal Navy squadron consisting of 11 ships and even a separate island—1200 miles further out in the Atlantic—was stocked with further garrisons to prevent a rescue attempt from South America. They were right to be concerned. During Napoleon’s last six years of life on St. Helena, escape plans included boats, balloons, and even a pair of primitive submarines. Notorious British smuggler Tom Johnson later claimed that in 1820 he was offered £40,000 to rescue the emperor. He hatched a scheme to do so that included a pair of ships with collapsible masts that could sneak up to the island fully submerged and a bosun’s chair to scale the cliffs. It’s unclear how far this plan ever got—or, indeed, if Johnson ever accepted such an assignment—but had it succeeded it would have made for one of the most fantastic prison breaks in all of history. 14. A HOUSE WAS BUILT FOR NAPOLEON IN NEW ORLEANS. Nicholas Girod, the fifth mayor of New Orleans, was a Frenchmen and avid supporter of Napoleon. Following the abdication at Waterloo, Girod helped members of Napoleon’s Imperial Guard escape to the New World. But he also had plans for the emperor himself to move to NOLA. In 1821, Girod, who had retired from the mayoral office, began renovating a home on the corner of Chartres and St. Louis Streets, which he claimed would be Napoleon’s residence after an intended escape expedition by Dominique You (also called Dominique Youx). When Napoleon died later that same year, Girod moved his own family into the building, but even today it is still known as Napoleon House. 15. NAPOLEON LIKELY DIED OF STOMACH CANCER—DESPITE 200 YEARS OF ARSENIC SPECULATION. Napoleon died on May 5, 1821, at the age of 51, while still in exile on St. Helena. At the time, his personal physician reported on the death certificate that the emperor had died of stomach cancer, consistent with reports that he suffered from abdominal pain and nausea in the last weeks of his life. But his body remained remarkably well preserved, a common side effect of arsenic poisoning, inspiring centuries of suspicion about foul play. In 1961, elevated levels of arsenic were detected in surviving samples of Napoleon’s hair, fueling these rumors further. Even if he wasn’t assassinated in that way, some theories suggested, perhaps he was accidentally poisoned by the fumes created by the arsenic in his bedroom wallpaper and the damp humidity on St. Helena. A 2008 study conducted by a team of scientists at Italy’s National Institute of Nuclear Physics in Milan-Bicocca and Pavia, however, disproved the poison suspicions. A detailed analysis of hairs taken from Napoleon’s head at four times in his life—as a boy in Corsica, during his exile on the island of Elba, the day he died on St. Helena, at age 51, and the day after his death—showed that while the levels of arsenic present were astronomical compared to modern standards (about 100 times what is present in the hair of people living today), there was no significant change throughout his life. What’s more, hairs from his son, Napoleon II, and his wife, Empress Joséphine, showed similar—albeit elevated—levels of arsenic. Chronic exposure, in paints and even as a medicine, throughout Napoleon’s life seem to be responsible for the inflammatory 1961 findings. Of course, all that arsenic—not to mention the myriad other toxic chemicals believed to be tonics at the time—likely hastened the emperor’s demise.